... so much fun, kids will flip! 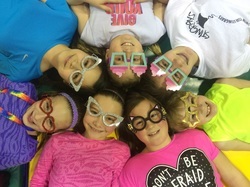 Our mission is to offer a FUN, safe learning environment for kids of all ages and abilities to learn and grow through gymnastics and physical activities. We take pride and focus on teaching kids more than just gymnastics. By promoting respect, trust, teamwork, personal growth, confidence, responsibility, safety, and communication through our programs, we create a positive atmosphere for our students to excel and progress as an athlete and an individual. Our facility exists to further the health and happiness for the NEXT GENERATION!!! only $3.00 per child after the first 2! Gymnastics classes for ages 3-12 and open gyms for ages 18 months - 12 years. Our parties are 2 hours of fun! Come and let us do all the work! The NEXT NINJA clinic is for boys ages 5-12. The NEXT CHEER clinic is for girls ages 7-12. If you are energetic, strong, outgoing, and like to try new things...these clinics are for you!